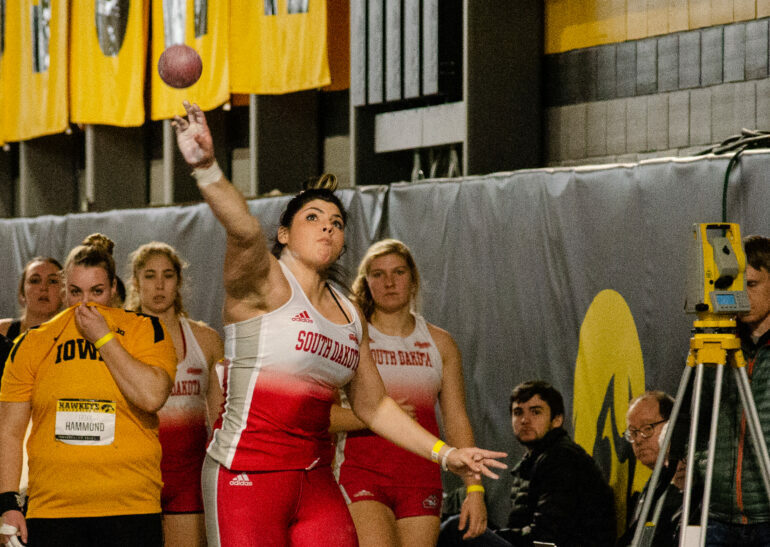 Mary Wester is a thrower for USD track and field team working on her degree in nursing. Mary is from Mount Pleasant, Minnesota. Molly Schiermeyer: How do you find time to manage athletics and nursing? Mary Wester: Planners are a huge help. Having my week set out a week in advance and being able to look at it and review all of the assignments I need to prep for is important along with my scheduling when I plan on studying and and I plan on eating. MS: How did you understand Javelin so quickly? MW: I think being a thrower really helped. Not that all of the events are similar to javelin, because they are all different, but understanding the concept of what you are trying to do was helpful. On top of that having really supportive teammates who understand the events and a really understanding coach who speakings in terms that I can put into my throw was probably the biggest help. Having that constant support not only from my coach but also from my teammates was how I understood the javelin so quickly. MS: How was having your dad as a throws coach? MW: Having my dad as a throws coach was really interesting because I never had to go anywhere to talk to him. He was just always there so the person who’s coaching you and has all of the knowledge is readily accessible 100% of the time and that was really awesome. I always had someone who wanted to watch film and would pull me aside and say ‘hey I saw this let’s do this next time’ and he would always be work shopping our next practice before it even happens. It was definitely a way that we got closer as a daughter and father and the only way to describe the experience is awesome.